When love and romance are in the air you need a bold heart to make a statement. This stunning key ring is the perfect choice. It offers a three-dimensional heart in a smooth finish that cannot be missed. The heart has a small loop on the top which attaches to a link metal chain that connects to an all metal split key ring. The heart has an added fun value, it is a stress toy and can be squeezed and squashed to release tension and frustration and it will still love you. The bold Valentine colour is fun and trendy. Uplift your marketing campaign with a warm and feel-good ambiance. Hearts talk to the mind and the emotions and will make an impact with your clients and potential clients. 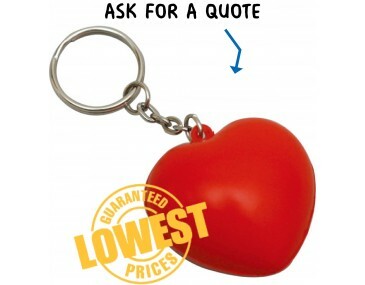 Brand your company logo onto the heart and give these key rings away as freebies at expos, shows, parties and other fun occasions. They are great for fashion houses and jewellery companies. They will also make a meaningful statement in the health sector for promoting healthy eating and a healthy lifestyle to prevent heart related problems. Talk to our artists about branding. Our listed price includes branding of your logo or graphic in a single colour print.